This is a simple sewing project. 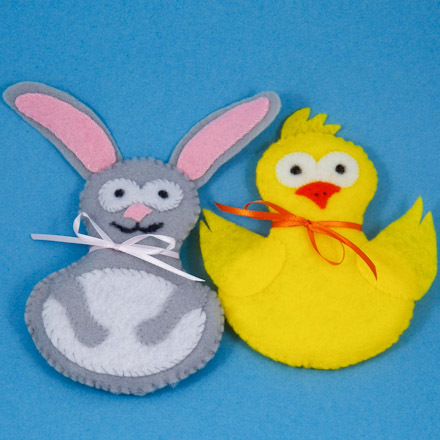 The project features stuffed felt animals for Easter: a chick and a bunny. It also includes a pattern for making felt eggs and a cracked eggshell for the chick. Beginning sewers will use the overcast (whip) stitch to assemble the animals and eggs, while more experienced sewers can improvise with stitches and embellishments of their own choosing. You can make the chick and bunny in the colors shown, or get wild with bright colors and printed felt! Related crafts: See Aunt Annie's other easy Needle and Thread Crafts. 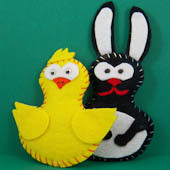 Choose the animal, chick or bunny, that you want to make. Download and print the pattern for it. 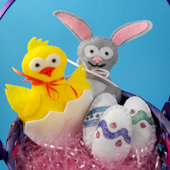 You can also make stuffed felt eggs or a cracked eggshell to go with you stuffed Easter animals. See the sidebar for how to make the eggs. Patterns are Adobe PDF files. Thee Adobe Reader is available for free. Cut out each paper pattern piece on its black outline. Each pattern piece is labeled with its part name and the number of felt pieces that need to be cut using the pattern. Pin each pattern onto a piece of felt; for the stuffing pattern, pin to batting. Use two layers when two pieces need to be cut. Cut around the patterns. 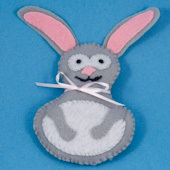 For the bunny, use gray for the body and ears, pink for the ear insides and nose, and white for the eyes, tail and tummy. For the chick, use yellow for the body, wings, and tail, orange for the beak, and white for the eyes. Of course, you can use any colors of felt you like! Use an overcast stitch (also called whip stitch) to attach the felt decorations. A straight (running) stitch is fine, too. For how to make overcast stitches and stitching practice, see the Sewing Cards craft project. For the bunny, sew the eyes, nose, tummy and arms to the body front, sew the tail to the body back, and sew the ear insides to the ears. 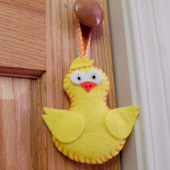 For the chick, sew the eyes and beak to the body front and the tail to the body back. Pin the pieces on the body to make the sewing easier. Use the black marker to draw black dots for eye pupils and a mouth for the bunny. The chick's wings and comb and the bunny's ears will be attached to the body later. Tip: Try to make your stitches nearly invisible by using small stitches and thread in a matching color. Put the two pieces of batting between the body front and back. Be sure that all layers are stacked evenly and the batting doesn't stick out anywhere. Pin the layers together. Stitch around the outside edge with overcast stitches. Tip: Be sure to make evenly spaced stitches of the same size. Use embroidery floss in a contrasting color for these stitches—or, if you don't want people to see your stitches, use a matching color. Use an overcast stitch to attach the bunny's ears to the back of the head. Position the ears about ¼ of their length below the top of the bunny's head. Also use an overcast stitch to attach the chick's wings to the body front and the comb to the top of the head. Tip: For both the ears and wings, be sure to stitch through only the top layer of felt. 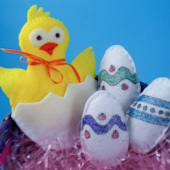 Craft extra: Make some stuffed felt eggs to go with your bunny and chick or a cracked eggshell for the chick. See the sidebar for more details. That's it! Your stuffed felt chick and bunny are complete! Tip: Add a hanger to your stuffed chick by sewing a loop of ribbon to the back of the chick's head. Project extra: Make stuffed eggs or a cracked eggshell to go with your stuffed animals using the templates in the Stuffed Felt Eggs pattern. How to make: Cut two layers of white felt for each egg, decorate the felt using permanent markers, stitch the layers together with straight stitches and stuff with polyester stuffing. For the cracked eggshell, cut two layers of white felt, stitch the layers together at the bottom using a straight stitch and place the stuffed chick inside. Tip: Tie a ribbon around the bunny's or chick's neck. Tip: Make the stitching show by sewing the bodies together with contrasting embroidery floss. You might also use wiggly eyes instead of drawing on eyes. 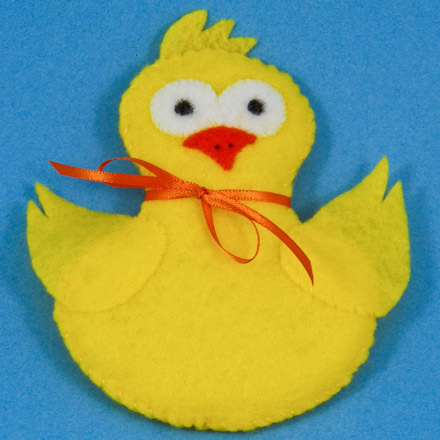 Tip: The stuffed chick has fewer parts and can be made more quickly than the bunny.